When it’s truly cold outside, a standard jacket just won’t cut it. While an insulated jacket can help keep you warm, it doesn’t produce any heat. So, if you want to stay warm, you need to layer up with some pretty thick jackets to survive the cold. A heated jacket is a practical solution to keeping your body temperature up. Whether you’re hiking, camping, or taking a walk outdoors, a heated jacket provides warmth from within. A heated jacket is a fantastic option for a versatile, yet functional layer in cold environments. Coming up, we’ve got the ultimate buying guide for finding the best heated jacket. We put together a list of our picks for of the best heated jackets to keep you warm with a little help from modern technology. The ororo men’s softshell heated jacket combines style and functionality into one simple package. A water and wind resistant polyester softshell outer protects the 7.4-volt heating unit inside so you can stay warm and dry in the harshest conditions. Where this heated jacket really shines, however, is in its added features. The ororo heated jacket comes with a detachable hood, so you can wear it in town, on trail, or at work. Plus, the jacket is machine washable, so you don’t have to worry about getting it dirty. 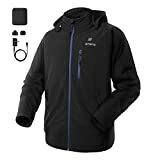 If that wasn’t good enough, the battery on this jacket lasts up to 10 hours on low, 6 hours on medium, or 3 hours on high, so you can stay warm wherever you are. The battery also has a USB charging port for phones and small electronic devices to help you stay connected. NEAT AND TAILORED DESIGN WITH DURABLE FABRIC: Soft shell fabric exterior with fleece lining ensures you don't lose any excess heat and enjoy comfortable warmth; Detachable hood is specially designed for chilly mornings and extra protection on windy days; Water and wind resistance for your unrestricted movement towards outdoor. QUICK AND LONG-LASTING WARMTH: Heat quickly in seconds with 7.4V UL/CE-certified battery; Up to 10 working hours; USB port for charging smart phones and other mobile devices. The Milwaukee KIT is a classic heated jacket design that pumps out lots of heat quickly to keep you warm in rapidly changing conditions. With a high-output 12 volt battery and three heating settings, you can easily customize the temperature to fit your needs. The jacket is built with carbon fiber heating elements in the chest, back, and front hand pockets that rapidly radiate heat once you turn on the battery pack. The jacket’s high-loft insulation and water-resistant, super durable shell also make a serious difference in cold temperatures. Plus, the battery is easily rechargeable and can also work as a compact power source for your phone or electronics when you’re out and about. 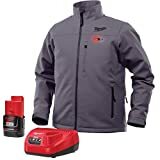 Although the Milwaukee KIT is a bit more expensive than some of its competitors, the jacket’s durability and high heat output make it a great option for people who need to stay warm during the colder months. This jacket from ororo is a women’s specific cut with the same great features found in the men’s version. Built with a softshell outer fabric and a nice interior fleece liner, this jacket feels cozy and warm even when the weather isn’t cooperating. The detachable hood is perfect for keeping extra warm during an arctic freeze while also giving you the versatility to look good in town. This jacket’s water-resistant fabric also helps keep you dry in the snow or rain. Plus, the 7-volt battery efficiently heats the three carbon fiber heating elements across the chest, and mid-back while also allowing you to charge your phone on the go. STYLISH DESIGN WITH DURABLE FABRIC: Soft shell fabric exterior with fleece lining ensures you don't lose any excess heat and enjoy comfortable warmth; Detachable hood is specially designed for chilly mornings and extra protection on windy days; Slim-fit design relieves you of worrying about bulkiness. Water and wind resistant. The Ptahdus heated jacket is specifically designed to distribute warmth effectively across the body. With 5 carbon fiber heating zones and hand warmers in the pockets, the Ptahdus jacket is made for the cold. One of the best things about this jacket is that it provides wearers with a fully customizable experience. You can choose from one of three different heat settings to get the right temperature no matter the conditions. Plus, you can separately control the hand warmers and the rest of the jacket, which is great for cool mornings that only require a small bit of extra heat to keep you going. 5 Heating Zones with Hand Warmer: Carbon fiber heating elements powered by Li-battery creates and distributes warmth to the chest, back, and hand warmers in front pockets. Selectable Heating Levels：These two one-press LED controllers allow users to control the hand warmer and body warmer respectively, and choose from 3 heat settings, delivering ideal heat for any situation. Quick-Heat Function and Last Long: Improves the traditional pre-heating drawback and allows users to feel heat in seconds. Up to 8 hours of running time in Low setting. Waterproof and Breathable: DWR (durable water repellent) coating is added on fabrics to strengthen its water resistance but don't reduce its breathability to a maximum extent. The DEWBU heated jacket is a high-tech model in our lineup. 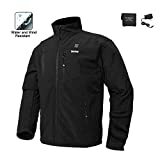 This jacket has three different heat modes, each with its own corresponding LED color to help you easily switch temperatures quickly, without having to take your glove off. If that wasn’t enough, the jacket has a built-in safety feature which can automatically switch from high to medium temperature after 5 minutes to protect you from overheating while wearing it. The simple wiring system and stretchy fabric also make this jacket from DEWBU both comfortable and practical for all-day wear in the cold. Three heated modes: Can adjust the temperature modes by pressing the power button briefly. the jacket have body protection function, when the temperature is too high, it will stop working immediately; if a short circuit is encountered, the system will automatically cut off the power supply to fully protect your safety. 12 Months warranty and CE-certified battery: The battery specification (the capacity: 7.4V 4400mAh), the three carbon fiber heated zones (left and right chest, middle back) generate heat in the jacket. Material: The soft shell is adopted on the surface, has excellent stretchability is excellent in stretch performance, wind resistant, water repellency, breathability. the jacket can automatically switch from the high temperature mode to the medium temperature mode after 5 minutes from the start of power supply. The package list includes: 1x Heating apparel, 1x Battery, 1x Battery charger, 1x Instruction manual. In addition, please notice that the size are manually measured with error of 0.6~1 inches. please check your measurements to make sure the item fit before ordering. The Smarkey Cordless Heated Jacket provides a lot of warmth in a slim-fit design. With three heating elements in all of the important core areas, the jacket is designed to keep you warm even while moving. This jacket comes fully outfitted with an LED sensor system, so you’ll always know what temperature it’s heating to. It also has a preheat mode, so you never have to stand outside shivering while you wait for your heated jacket to warm up. Oh, and it’s machine washable, so you don’t have to worry about a little bit of dirt while you’re out on an adventure. 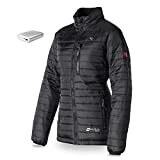 The Venture Heat women’s heated jacket is the ultimate mix of style and functionality. Unlike most other heated jackets, this one is also a puffy jacket, which means it has a layer of fluffy insulation to help trap in the warmth from the heating elements. The battery-powered heating pack is operated using an exterior button, so you don’t have to unzip the jacket to turn up the heat. You can also charge your phone using the battery pack while storing it in one of the interior zippered pockets. The best part? The Venture Heat comes with a 5-volt battery with an astounding 12-hour runtime to help keep you warm day in and day out. 3x FLEXIBLE HEATING PANELS: Boost your core body heat with 3 built-in battery powered heating panels. Ultra-thin and efficient heating elements ensure smooth comfort and quick warmth. Super flexible heating elements allow you to fold and pack your jacket away into storage without worry of damage. 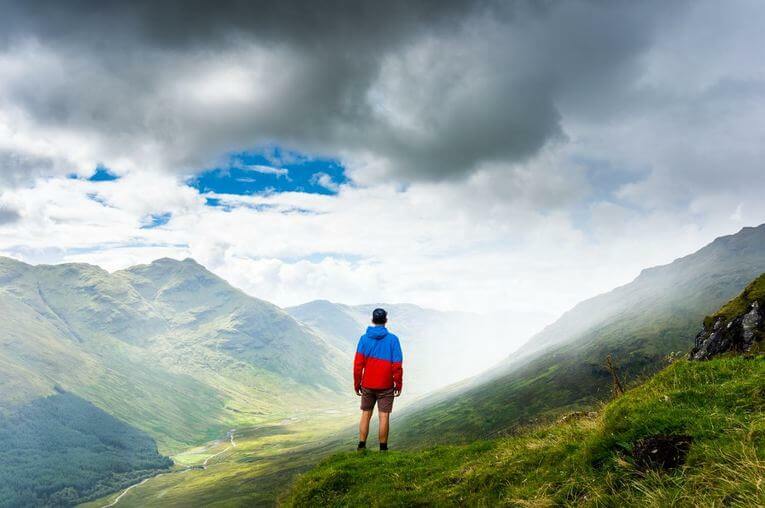 RESIST THE ELEMENTS: Our heated clothing is wind resistant and water resistant against weather, rain, and snow. Perfect for your next winter adventure. STYLISH COMFORT: Our tailored puffy jacket features 3 outer utility zippered pockets, 3 zippered inner media pockets, elastic drawstring, and a coat loop. YKK zipper. Insulated nylon. Heated jackets are outfitted with battery-powered heaters, so instead of having to use your own body heat to stay warm, a heated jacket does the work for you. These jackets are perfect for anyone who spends time outside, whether that be for work or for fun. The best part about a heated jacket is that the heat setting is fully adjustable. This means that one heated jacket can do the work of two or more standard jackets without any of the weight and extra bulk. Plus, regardless of how cold it is outside, you can ensure that a heated jacket pumps out enough heat to keep you warm until you can get back inside. While your standard jacket is made up of layers of insulation (usually either fleece, down, or synthetic fill), a heated jacket does away with bulk and replaces it with battery-powered heat. Heated jackets have battery packs that are connected to heat-producing pads to help keep you warm in adverse conditions. They use 2 standard heating elements to maintain warmth: carbon fiber and copper wire. The more popular and modern heating element is carbon fiber, it’s lightweight and gives you more freedom of movement. If you’ve sought out a heated jacket buyer’s guide, chances are that you already spend a good amount of time outside in the cold. People who work outside, particularly in construction, or who enjoy spending time in the great outdoors will know all too well that being underdressed for the weather can be an uncomfortable, or even dangerous situation, in a cold environment. Luckily, thanks to heated jackets, we no longer have to worry about bundling up under a dozen layers to stay warm in the cold. Here, we’ll take you through the ins-and-outs of heated jackets and clue you in to what you should look for in a heated jacket before you buy one. Heated jackets come in a variety of different materials, each of which has its own benefits and disadvantages. For the most part, however, what’s important to us as consumers is whether or not the jacket is waterproof or water resistant. Since we’re likely to be wearing our heated jackets in cold, windy, snowy, or even rainy conditions, having a waterproof or water resistant model could make a huge difference. Plus, waterproof or water resistant models also help protect the built-in battery pack from the elements. The main downside to a waterproof or water resistant heated jacket is that they often cost a bit more than their non-waterproof counterparts. But, if you value warmth and comfort above all else, a waterproof heated jacket might be worth the investment. Heated jackets tend to be quick slim fitting and stylish. Since they don’t need to rely on insulation for warmth, heated jackets tend to blend in quite well and often look like a jacket you’d normally wear around town. That being said, there are plenty of different styles out there in the world of heated jackets, so it’s important to find one that fits, feels, and looks good. Voltage can actually be a tricky concept to grasp if you get lost in all of the nitty-gritty details. 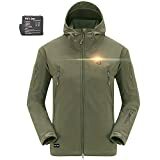 When it comes to heated jackets, however, you can generally operate with this rule of thumb: the higher the voltage, the hotter the jacket can get and the larger the coverage area of the heat. Basically, this means that, in practical terms, a higher voltage jacket will be warmer than a lower voltage jacket. But, a higher voltage will often result in a more expensive battery and, thus, a more expensive jacket. Plus, higher voltage batteries tend to be heavier and bulkier than their lower-voltage counterparts. hese days, pretty much all heated jackets run on rechargeable batteries. While there may be a few models out there that rely on old school AAs, for the most part, you’ll need to charge your heated jacket every once in a while so it’ll keep you warm. When it comes to evaluating the quality of a heated jacket’s battery, however, it’s important to consider how long the battery will last and how long it takes to charge. A battery that lasts 12 hours and charges in 30 minutes will likely cost much more than a battery that lasts 6 hours but takes 2 hours to charge. Moreover, some heated jacket battery packs can also be used to charge your phone or other USB-compatible devices while also keeping you warm. These extra features can be useful, but sometimes increase the weight and cost of a heated jacket. While there are a lot of great heated jackets out there, only one can be the winner of our head-to-head lineup. Out of our men’s models, we declare the Milwaukee KIT to be our top choice. With a great mix of comfort, style, and a high-voltage battery with an impressive 8-hour battery life, there’s a lot to love with the Milwaukee KIT. When it comes to a women’s heated jacket, we think you really can’t go wrong with the Venture Heat. 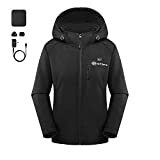 A puffy jacket with great, stylish looks, the Venture Heat has all of the bells and whistles you’d expect from a heated jacket with a phone charger and exterior button heat control. But, it’s also got a fantastic 12-hour battery life and insulation to help trap in the heat.